The basic package includes an emailed Personalized Certificate of Adoption and Fun Facts about Manta Rays. The deluxe package includes a Personalized Certificate of Adoption, Fun Facts about Manta Rays, MCC Sticker, Specific details about your Manta Ray, and a Photo of your Manta Ray. 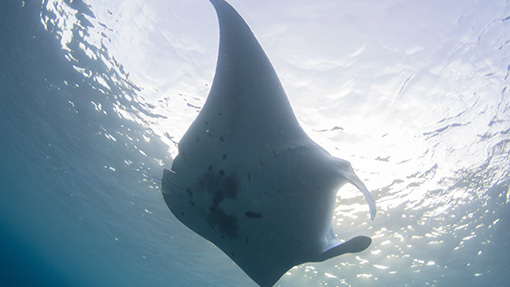 The supreme package includes a Personalized Certificate of Adoption, Fun Facts about Manta Rays, MCC Sticker, Specific details about your Manta Ray, Six-month update about your Manta Ray, aPhoto of your Manta Ray, a Manta Ray stuffed animal, Recognition on MCC Social Media, and $100 off signup for any “Travel – With – Us” citizen science research trips. The exclusive package includes Exclusive individual manta ray adoption, personalized Certificate of Adoption, Fun Facts about Manta Rays, MCC Sticker, Specific details about your Manta Ray, Six-month update about your Manta Ray, Photo of your Manta Ray, Manta Ray stuffed animal, Recognition of donation on website and social media, and $100 off signup for any “Travel – With – Us” citizen science research trips. Includes acoustic receiver and tag for Manta Ray small-scale movement. Come be a scientist for a day and help us deploy your donated acoustic receiver and tag. If you are unable to attend, we will video our research day. You will receive a Personalized Certificate of Adoption, Fun Facts about Manta Rays, MCC sticker, individual picture of your Manta Ray, and a detailed historical information about your Manta Ray. We will give you a personalized update of what we learn from your acoustic receiver and tag. Recognition of donation on website and social media. Includes satellite tag for Manta Ray large-scale movement. Come be a scientist for a day and help us deploy your donated satellite tag! If you are unable to attend we will video our research day. You will receive a Personalized Certificate of Adoption, Fun Facts about Manta Rays, MCC sticker, individual picture of your Manta Ray, and detailed historical information about your Manta Ray. We will give you a personalized update of what we learn from your satellite tag and recognition of donation on website and social media.